Sometimes the in-flight “safety lecture” and announcements are a bit more entertaining . . . .
A plane was taking off from Kennedy Airport. After it reached a comfortable cruising altitude, the Captain made an announcement over the intercom, "Ladies and gentlemen, this is your Captain speaking. Welcome to Flight Number 293, nonstop from New York to Los Angeles. The weather ahead is good and, therefore, we should have a smooth and uneventful flight. Now sit back and relax... OH, MY GOD!" - Silence followed, and after a few minutes, the Captain came back on the intercom and said, "Ladies and Gentlemen, I am so sorry if I scared you earlier. While I was talking to you, the Flight Attendant accidentally spilled a cup of hot coffee in my lap. You should see the front of my pants!" A passenger in Coach yelled, "That's nothing. You should see the back of mine!" 1. Airplanes don't object to a preflight inspection. 2. Airplanes come with manuals to explain their operation. 3. Airplanes can be turned on by a flick of a switch. 4. Airplanes don't get mad if you do a "touch and go"
5. Airplanes have strict weight and balance limitations. 6. Airplanes can be flown any time of the month. 8. Airplanes and pilots both arrive at the same time. 9. Airplanes don't mind if you look at other airplanes. 10. Airplanes don't mind if you buy airplane magazines. 11. Airplanes expect to be tied down. 12. 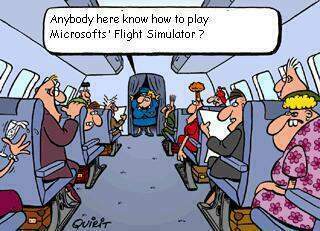 Airplanes don't comment on your piloting skills. 13. Airplanes don't come with in-laws. 14. Airplanes don't whine unless something is really wrong. 16. Airplanes usually kill you quickly, a woman takes her time. 1. You can eat a four course meal standing at the counter in the kitchen. 2. You reach for your seat belt when you sit on the toilet. 4. You can pack for a four week trip to Europe in one roll-aboard and one totebag. 5. You can sleep sitting bolt upright in a chair - any chair, anytime. 7. You can recognize pilots by the backs of their heads, but not by their faces. 8. You can tell 70 yards away if a piece of luggage can fit in the overhead bin. 10. You NEVER hear announcements the pilots make - if they want you to know something, they must call on the interphone and tell you personally. 11. You can tie a neck scarf 36 ways. 12. You know at least 63 uses for air sickness containers - NONE of which pertains to vomit. 13. You can actually enjoy a crew meal which is eaten on the jumpseat right next to the lavs, which are in constant use. 14. You understand and actually use the 24 hour clock. 15. You can get more therapy from conversations on the jumpseat than you can from your $150 an hour psychologist. 16. You can follow the plot line of a movie without ever hearing the audio portion. 17. You don't think in "months" - you think in "bid periods". 18. You own two sets of uniforms: fat and thin.